Reverberate is a podcast exploring our wide world of textiles and the people who grow, design, make and wear them. Produced by A Verb for Keeping Warm in Oakland, California. Hosted by Adrienne Rodriguez. We plan to release vibrant episodes packed with interviews, conversations and stories from vital contributors to the fiber community. Examining the threads that tie us together across the country and the world. Join us on our audio adventures! At A Verb for Keeping Warm we work with many textile makers, teachers and artists. We hope to share with you some of those people and their work to inspire your own work. Youngmin Lee is a Korean born textile artist living in the SF Bay Area who teaches at A Verb for Keeping Warm. Her work features the beautiful and intricate Korean textile art of patchwork known as jogakbo. This patchwork is mostly seen on traditional wrapping cloths called bojagi. These wrapping cloths impart the maker’s wish for happiness among other good fortune for the receiver of the gift. Each piece Youngmin makes is hand stitched with intention and delicate skill. She teaches these techniques and Korean culture around the world to share this eloquent textile heritage. Kristine and Adrienne interviewed Youngmin Lee in person about her work, how she got started making, and the history and cultural significance of these textiles in Korea. This interview was recorded in person at A Verb for Keeping Warm in Oakland, California. If you are a new listener to Reverberate, please subscribe and share with your friends! Also don’t forget to rate and review on iTunes. In this episode, first, I speak with Kristine Vejar the owner of AVFKW, then I share an interview with Bristol Ivy. Annie Claire reads a description of her design. And finally, Kristine and I do a quick recap.This is the 8th and last episode of the Fall 2018 Lookbook Series. In episodes 1-4, we followed the path of creating our yarns Pioneer, Flock, Dawn, and Ridge. These yarns are made from Sally Fox’s wool and are milled at Green Mountain Spinnery. Now we’ve switched gears, and are following the path of how our yarn Gather is created - in episode 5, you can hear Lani Estill talk about growing the wool, in episode 6, Rob teaches us about milling Gather and gives us insight to how he incorporates sustainability into the milling process, and now in episode 7 - we hear from Lora Kinkade, the farmer who grew dye plants for us this past Summer which were used in the Lookbook collection of yarn and patterns. In this episode, first, I speak with Kristine Vejar the owner of AVFKW, and then I share an interview with organic farmer and sheep shearer, Lora Kinkade. In this episode, first, I speak with Kristine Vejar the owner of AVFKW about our trip to visit Mystic Pines Fiber Mill, and then I share an interview with Rob, the owner of Mystic Pines, and then Kristine joins me again to talk about the intricacies of designing and making Gather. In this episode, Adrienne interview's Lani Estill, the rancher who raises the wool used in A Verb for Keeping Warm's new farm yarn, Gather. Then Adrienne checks-in with Kristine, the owner of A Verb for Keeping Warm - and speak to her about her dream of making a soft naturally-dyed yarn made with California wool. Following the AVFKW Fall Lookbook as our guide, there will be eight episodes dedicated to those featured in the lookbook, and who support AVFKW farm yarns Pioneer, Flock, Dawn, and Gather. Throughout this series, we will explore the intersection of raising materials for textiles and caring for the environment. In this episode of Reverberate, we interview knitwear designers Thea Colman and Elizabeth Doherty. In this episode, Adrienne speaks with Kristine, the owner of Verb, about the concept 100% for the Designer. And she talks to Mary Jane Mucklestone, one of the designers in the AVFKW Fall 2018 Lookbook, about her pattern The Diamondback Hat. In this episode, we follow the wool from the farmer to the mill. Kristine teaches us how the wool is prepared for the mill and I speak to David Ritchie from Green Mountain Spinnery located in Vermont. In this first episode of Reverberate, we introduce the host and producers of the new AVFKW podcast. We also discuss what the next episodes will feature and a fascinating interview with Sally Fox about her life and work. This is the Reverberate Podcast Promo - giving a tease for what's to come! 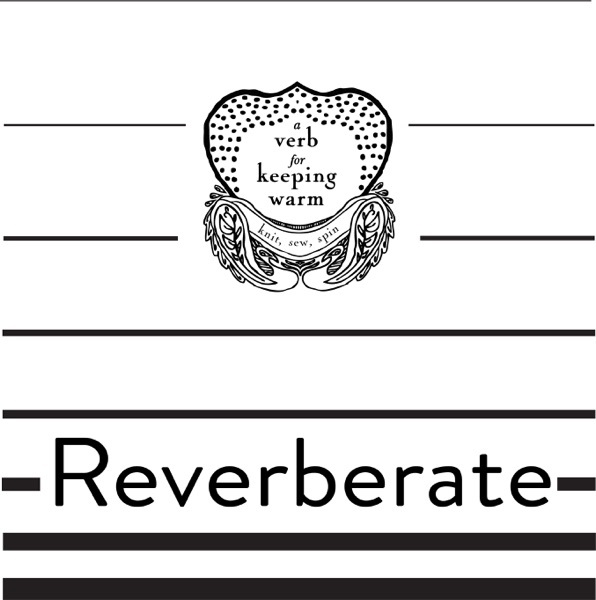 Reverberate is a podcast exploring our wide world of textiles and the people who grow, make, use, and wear them. Produced by A Verb for Keeping Warm in Oakland, California. Hosted by Adrienne Rodriguez. We plan to release vibrant episodes packed with interviews, conversations and stories from vital contributors to the fiber community. Examining the threads that tie us together across the country and the world. Join us on our audio adventures! Subscribe on your favorite podcast app - such as iTunes, Google Play, or Soundcloud to receive new episodes!